Using Shortcuts is easy, once you know how it works. Shortcuts is the hot new feature of iOS 12. The Shortcuts app lets you automate some crazy stuff, for instance this shortcut that activates the iPhone’s camera and sends an SMS if the cops pull you over. Thanks to Apple’s terminology, Shortcuts is a little confusing. Is it an automation tool? Does it have something to do with Siri? Why would you use it? We’ll answer these questions, and then build an awesome shortcut so you can see how the app works. These are also Siri Shortcuts. Thanks a lot, Apple. 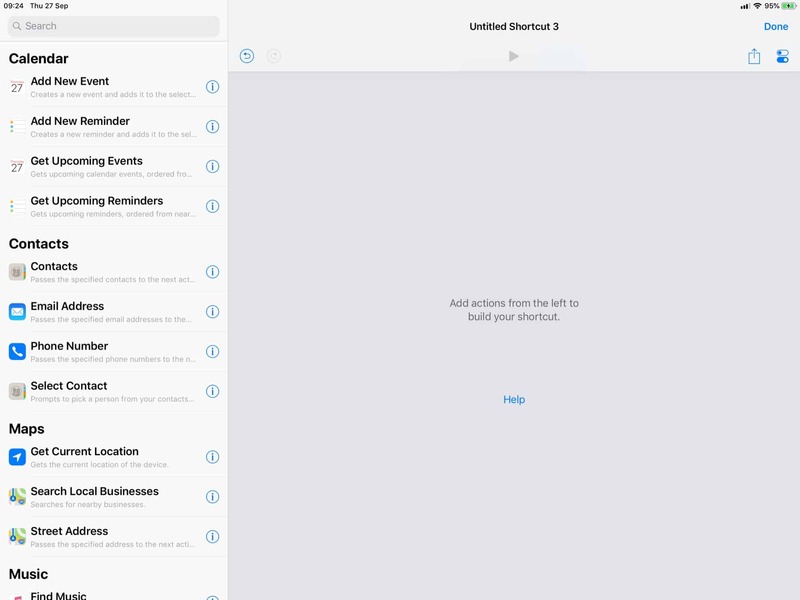 Shortcuts is a new Apple app that lets you easily automate all kinds of stuff on your iPhone and iPad, using drag-and-drop actions. shortcuts, with a small “s,” is an automation created with the Shortcuts app. They can be shared, and downloaded from the internet. 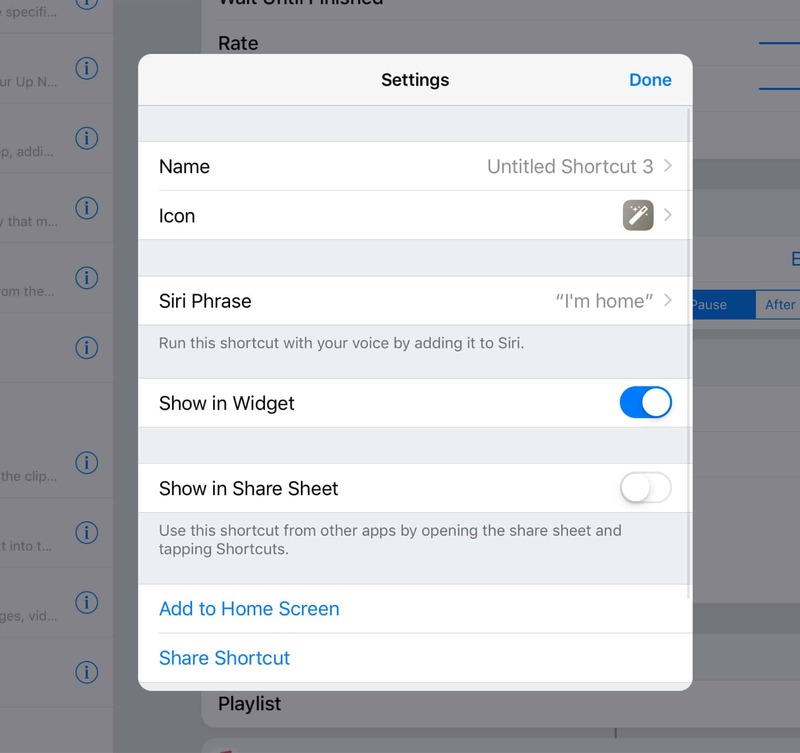 Siri Shortcuts is a new Siri feature that lets you run these shortcuts using a voice command. In iOS 12, Siri also learns how you use your device, and can therefore create its own shortcuts, which it will suggest to you. Shortcut Suggestions appear on the Spotlight Search screen when you swipe down one the Home screen. They show up below the app suggestions. This last one, Siri Suggestions, is pretty neat. It offers a hint at the full power of Siri Shortcuts. 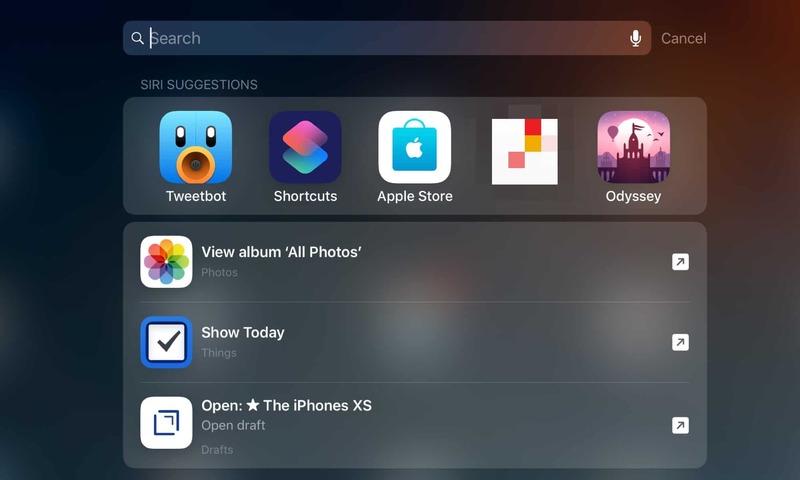 Siri might offer a button to go straight to the inbox of your favorite to-do app, for example, or show a link to a website that you often visit at that time of day. In the future, we’ll get to the other kinds of shortcuts. But today we’re looking at the Shortcuts app, and the small “s” shortcuts it produces. This is where you can build amazing automations that can be triggered in all kinds of ways. Download a YouTube video directly into the Files app on my iPhone. Take a screenshot, then put that screenshot into a nice iPhone X-shaped frame and save it to Dropbox. Convert songs and videos to MP3. Turn a live photo into a GIF. Those are very simple examples. If you like, you can get really fancy and program all kinds of complex steps. There are three main parts of a workflow. The input, the workflow actions themselves, and the output. The input can be anything — photos, text, spoken word, music, a webpage. 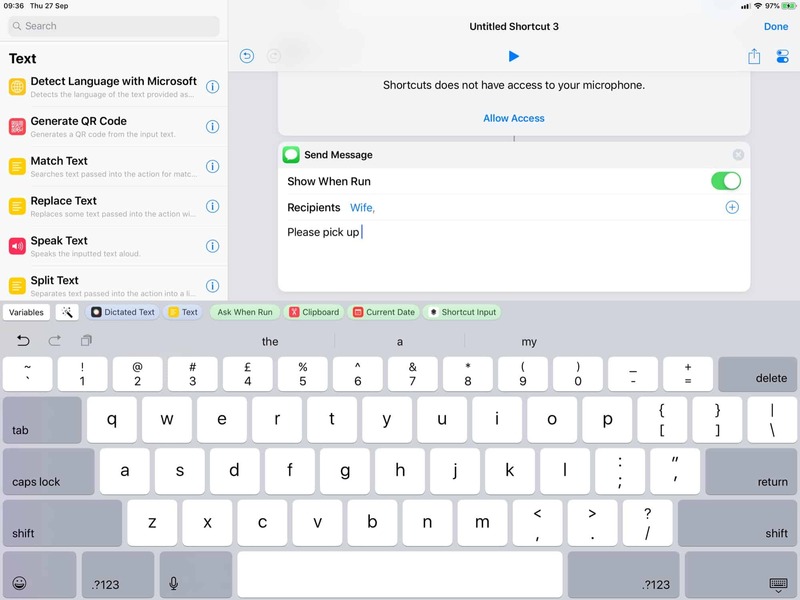 Often, you invoke a shortcut from the standard iOS share sheet. In the Photos app, for instance, you select some images, tap the Shortcuts icon in the share sheet, and then pick the workflow you want to send them to. This works in Safari, too, and pretty much anywhere else. The output could be photos (saved to your camera roll), an email, a message, a file saved to iCloud Drive, etc. It could be a translation spoken out loud by Siri. Or it could be all of these at once. So, to see how this works, let’s create a workflow from scratch. I’ll use the iPad, because the big screen makes it far easier to follow. The iPhone’s small screen makes things fiddly, but it all works the same way. Also, shortcuts built on the iPad sync to the iPhone. So, download the Shortcuts app and follow along. Turn on your lights with HomeKit. Play that soothing song baby likes. Send your wife a message to order dinner. This is a blank shortcut. On the left are all the actions you can use. The main, blank gray section is where you’ll drag these actions. Finally, at the top, on the far right, is a little double-switch icon that contains the settings for your workflow — its name, and some other important options. We’ll get to that later. First confusion: The list of actions is not complete. It just shows you a few coming actions. To force it to reveal everything, tap into the search field at the top. Shortcuts can run any of your HomeKit scenes. In this example, it runs my Arrive Home scene, which I would have set up to turn on the lights, and maybe start the baby-milk-heating device. In theory, I could also have this start the soothing music, but I want to show you how that works in the app. This one really shows the power of integrating Siri with shortcuts. 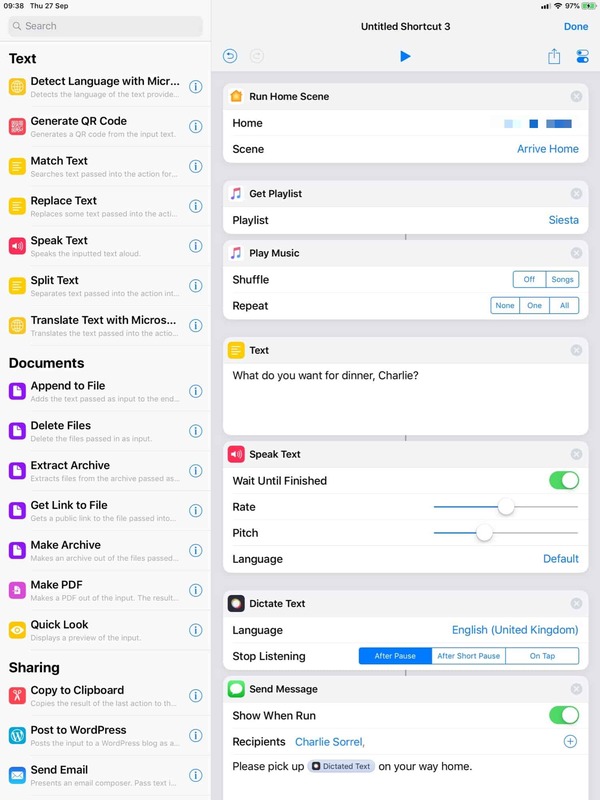 First off, Siri speaks the text prompt I set up: “What do you want for dinner, Charlie?” You can see the line connecting these two actions in the editor, because the written text is sent to the Speak Text action. 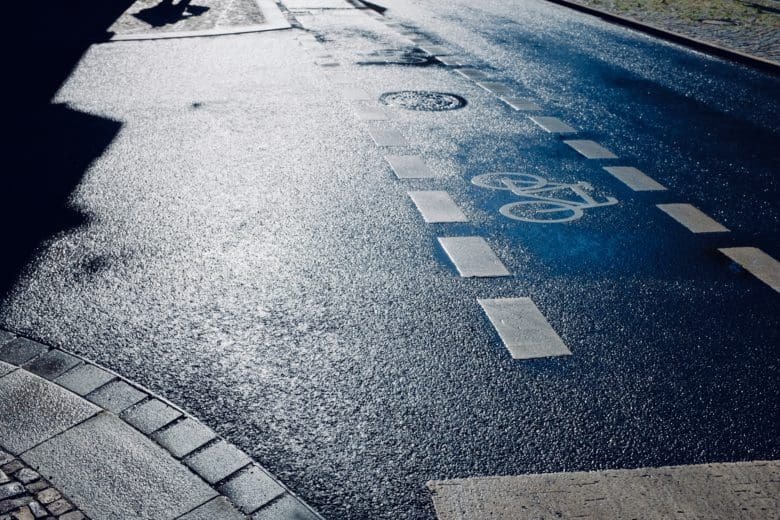 See how these two actions are joined? Then, the Dictate Text action listens to me. This is just like regular Siri dictation, only it is triggered automatically. I say something like “Pizza,” and pause. Siri remembers this. The next part is the neat part. In the Send message action, you’ll see it reads “Please pick up Dictated Text on your way home.” The Dictated Text part of that is actually the text I said to Siri in the previous step. In this case, it’s the word Pizza. You’ll find this token just above the keyboard in any text-entry field. To add it to your message, just tap to insert it. Also, be sure to toggle the Show When Run switch to off. This will send the message in the background, without showing it to you first. Also, I find the message-sending action a bit buggy. To make it send consistently, you can manually type or paste the contact’s email address into the Recipients field. Make sure to use the one associated with their iMessage account. This final section plays the playlist of your choice. It can’t play a single selected song, so the simplest workaround is to create a playlist of one song, and use that. Each shortcut has its own settings. In here you can give your shortcut a name, pick an icon, and choose several other options. For today, we want the Siri Phrase. Tap that, and you can record a trigger phrase. Photo: Hey Siri, I’m home! Now, whenever you want to run this shortcut, just invoke Siri and say the trigger phrase. You may want to test it with your own iMessage address first, to make sure it works before spamming your husband or wife. I ran into a few glitches on mine. For instance, it worked great on an iPad with HomeKit set up (I don’t have any HomeKit stuff, but I do have the app on the iPad). However, it failed on an iPhone. Also, certain actions require that your iPhone is unlocked to run them. That means that a hands-free Hey Siri invocation may not let the whole shortcut run. You will have to use Touch ID or Face ID to authenticate. This simple shortcut shows the power of the app. And this is just the start. With iOS 12, Siri can integrate deeply with many third-party apps as well as digging into the underlying parts of iOS itself. Take a look at the actions to get an idea of what’s possible. Finally, here are a few places to check out shortcuts and get help creating them. The first stop is the gallery inside the Shortcuts app, where you can browse and install ready-made shortcuts. You can also open them up and edit/tinker. Reddit’s r/shortcuts subreddit is a great place to get really deep, and to ask for help with shortcuts. The old r/workflow subreddit is also full of shortcut treasure. Most old Workflows work fine in Shortcuts. Find Shortcuts in Twitter is a great place to find shortcuts, ideas and links. 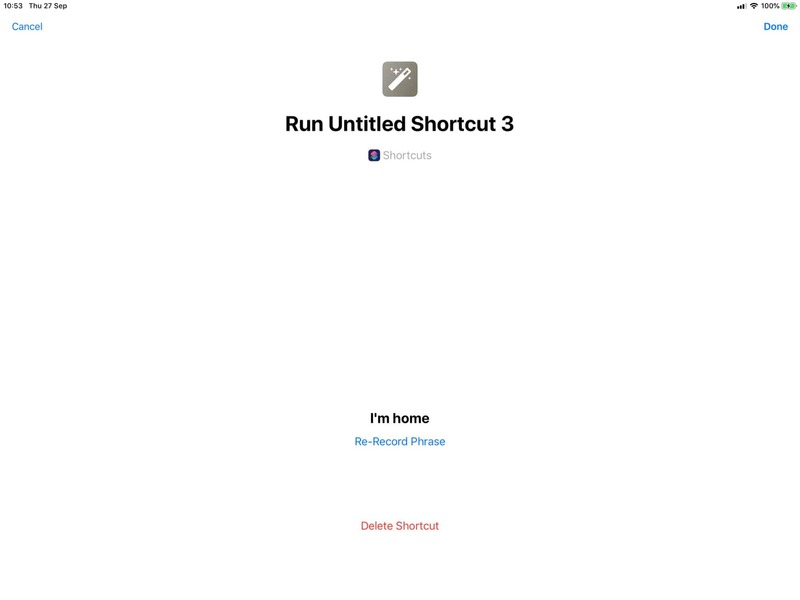 You can also read our previous Workflow posts to get some great shortcuts.